New Brighton District - Goodbye Sister Woo! Más tiempo en New Brighton! This week was not super eventful, just keepin’ on that mission grind! We have been trying to do more finding and expand our teaching pool, and hopefully get more progressing investigators. We've been trying to get more referrals from members, and also going through potential investigators in the area book, but sadly there's not much news as far as the investigators we have right now. But, some good news, we got the transfer board today! And me and Elder Nelson are staying here in new Brighton so that's good news! We are both still really new to the area so hopefully we stay for another transfer after this one, honestly it's such a sick area! The ward is just filled with MHA students at the U of Minnesota who are all return missionaries and they are all just super supportive, it's awesome. We have high hopes looking forward to the transfer! On Thursday we had a zone conference. And since we had it on Thursday we switched our FMSC (Feed My Starving Children – volunteer work) day to Wednesday. But it was a great conference! We talked a lot about what was mentioned in the worldwide mission broadcast and how we can use what we learned to improve the mission as a whole. Overall it was super powerful and an awesome experience! So after our zone conference we got to go on exchanges with the West St. Paul elders. I took Elder Christensen around new Brighton, and we had a great time. I got my tiwi card last week so I have started driving again for the first time in a few months and needless to say I might be a bit rusty.. we accidentally turned the wrong way down a one-way street. Hahaha! It was pretty frightening but we didn't get in a crash so it's all good😂. Other than that, we have been pretty safe here in Minnie, don't worry! Also on Friday we got “blitzed” from the APs and we got to have Elder Jones with us for the day! Unfortunately, all of our appointments fell through, but we were able to find a new investigator named Chris. He's super nice, but has had drug problems in the past so his mind isn't 100% there. He had some crazy theories about the queen of England being a reptilian alien species😂 It was interesting to say the least.. But, the cool part is he has a really strong desire to become a better father and grow his faith in Jesus Christ. So, we will see if we can help him out in the future! This Sunday we had fast and testimony meeting and I had a really sweet opportunity to translate some Spanish! I was sitting next to some of the Hispanic families and a recent convert went up to me and asked, “Si doy mi testimonio, ¿puede traducir para mi?” And I said, “Creo que sí pero solamente con oraciones cortas jaja.” It surprisingly went super well! The Spirit was really strong and it was so powerful. Although it's a slow progression, I can feel the strength from the Lord helping me improve my Spanish through the gift of tongues! One of the sisters here in new Brighton, Sister Woo, is dying (finishing her mission) and leaving to go back to Hong Kong on Wednesday. So, for a farewell celebration, this morning we had a district brunch at iHop with her and it was a fiesta! To end this week’s email I will leave you guys with a scripture. This scripture is the words of the ancient prophet Alma from the Book of Mormon: Alma 37: 6-7, "Now ye may suppose that this is foolishness in me; but behold I say unto you, that by small and simple things are great things brought to pass; and small means in many instances doth confound the wise. And the Lord God doth work by means to bring about his great and eternal purposes; and by very small means the Lord doth confound the wise and bringeth about the salvation of many souls." These verses are so powerful and help us understand that we don't always need huge experiences to help share the gospel of Jesus Christ. Through our small every day actions, we can be an example of our Savior and help share his love with others around us. Because by small means, Heavenly Father will help bring to pass many great things. I also think about this scripture and relate it to gaining a testimony of the restored gospel. Not everyone has a grand manifestation from God to know the truthfulness of the gospel. For example, my knowledge and testimony of the Book of Mormon didn't come all at once. It was over time, carefully studying and reading and many little instances of the peace and warmth of the Holy Ghost testifying that it is true. I have grown so much closer to my Savior through this book and I am so grateful for the many blessings that come from the restored gospel. 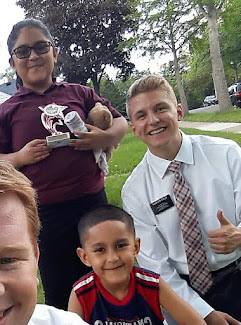 I am enjoying being out here in the mission field so much, and I can feel myself growing and strengthening my testimony and faith. I hope you all stay safe and warm back home!